UU A Way Of Life: Would the Holy Family be welcomed in the U.S. this year? Would the Holy Family be welcomed in the U.S. this year? 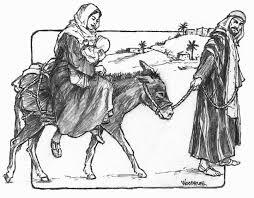 Jesus was born when Joseph and Mary were traveling. After His birth in Bethlehem they fled to Egypt to avoid the infanticide ordered by Herod. Who would take this small family in? If today they were fleeing from Honduras to the U.S. they would be rejected at the U.S.' Southern Border. Jesus might be taken from Joseph and Mary and put in a juvenile detention center while Jospeh and Mary are extradited back to Honduras, the land where the killing is taking place. People in the United States prize their culturual Christianity, but they do not behave like Chrisitans. Even those who proclaim themselves the most evangelical, support policies and leaders which are the opposite of Christian. At this time of Advent we prepare ourselves to welcome the Messiah and his parents, the Holy Family. Would that we vote for leaders and policies that will make this possible. Unitarian Univeralists stand out among religious people covenanting together to affirm and promote justice, equity, and compassion in human relations. We are an inclusive and welcoming religious tradition. The Messiah and His Family are welcome among us.